With increasingly more attention paid to multilayer barrier films and sheets for the purpose of increasing the shelf life of packaging, coextrusion foaming should be considered an appealing option as it provides the means to manufacture lighter products with lower material cost while maintaining the overall thickness of the film or sheet. Not only can foaming reduce weight and lead to raw material savings, but it can also create favourable properties in the film. By foaming one or more layers embedded in a coextrusion film or sheet, thermal and sound insulation can be improved, flexibility and conformability can be enhanced, and opacity can be obtained without using any fillers. Furthermore, the sealing performance can be maximized thanks to intrinsic recoverable response when mechanically compressed. The following are examples of promising packaging applications where advanced extrusion foaming technology can be utilized to provide improved functionality and benefits to both manufacturers and consumers. Foamed thermoforming sheet with reduced weight that can save polymer resin cost up to 50% while retaining similar rigidity as the original non-foamed version. Replacement of existing paper packaging and styrofoams with low-density PLA foam, which is biodegradable. Multilayer coextrusion foam sheet that requires the combined features of excellent barrier properties with mechanical sealing as a gasket (see Figure 2). Coextruded foamed meat trays without the need for water-absorbent pads by coextruding a surface layer with a special open-cell foam structure and chemical formulation. Foamed packaging sheet having superior thermal insulation performance without using environmentally malignant blowing agents. 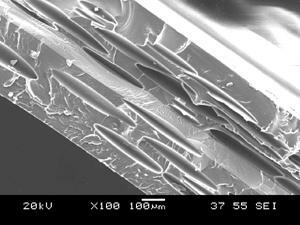 The density of foamed multilayer structures plays a key role in application suitability as it affects strength. In the case of high density foams (foams that have a density range of 0.5 – 0.9 g/cc - see Figure 3a), the foamed cells are isolated from one another and their cell wall thickness is greater than that of low density foams. In the case of low density foams (density below 0.3 g/cc – see Figure 3b), the cell walls often contact each other and their cell walls are thinner than that of high density foams. 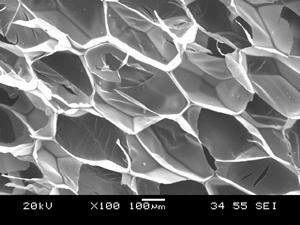 When cell walls touch there is a higher chance of cell opening, particularly when the expansion ratio of foam is considerable. Closed cells have relatively greater rigidity and elasticity as well as superior mechanical strength compared to ruptured open cells. Since high density foams feature separated closed cells and thick cell walls, they are resilient enough to restore the original shape after all types of strain. This advantageous feature makes high density foam structures highly suitable for packaging applications. Developmental focus in this area will help expand the scope of application of multilayer packaging film containing cellular structures. Polymeric foams are typically divided into two groups depending upon the cell size and cell population density; macrocellular foams, and microcellular foams. Macrocellular foams have cell sizes of 50 μm or larger and are frequently used as thermal insulation and packaging materials since they do not have excellent mechanical properties. Microcellular foams typically have cell size range of 1~10 μm along with a very high cell population density in the range of 109-1015 cells/cm3. The foam layer of coextruded packaging films does not necessarily have to be a microcellular structure to be effective, but it will be ideal cellular structure in the aspect of mechanical and thermal insulation properties. In addition to that, the microcellular foam structure is expected to provide higher surface quality thanks to the fine and uniform cell size distribution compared to the macrocellular foam structure. To achieve the extremely high cell population densities featured by microcellular foams, an abrupt thermodynamic instability must be induced in a homogeneous polymer/gas solution. For the extrusion foaming process, the easiest way to maximize the cell population density is to design the die geometry with a high pressure-drop rate where the melt moves through the die quickly. When it comes to the blowing agent for foaming, either a chemical blowing agent (CBA) or a physical blowing agent (PBA) can be selected depending upon the desired density of foamed materials. CBAs are substances that can decompose at a certain processing temperature, allowing a controlled release of gases like CO2 and/or N2. Commonly, solid organic and inorganic substances, such as azodicarbonamide and sodium bicarbonate, are used as CBAs. CBAs are divided by their enthalpy of reaction into two groups comprising exothermic and endothermic foaming agents. The chemical reaction that generates the gas can either absorb energy (endothermic) or release energy (exothermic). In most cases, CBAs can be used to reduce the density by 20-50%, whereas PBAs are usually incorporated to produce considerably low density foams. The most frequently used PBAs are CO2, N2, n-butane, n-pentane, FCs, CFCs and HCFCs. These blowing agents have high solubility in polymer melt that allows foam structures with high void fractions to be produced at low processing pressure and with large volume expansion ratios. Since they have lower diffusivity due to their larger molecular size, the gas loss from the foamed extrudate is substantially reduced. Accordingly, the final foam product can have a much lower foam density. In order to completely dissolve PBAs or the entire gas amount emitted from CBAs, the internal pressure of an extruder should be higher than solubility pressure, which is the minimum pressure required for dissolution of the desired gas amount. In this sense, a spider type annular die is much more favorable for making high cell density foams because it is common for a spiral type annular dies to have relatively lower pressure drop rate as a result of their long, narrow flow channels. The same principles are applied to the T-die extrusion process for casting sheet with a foamed layer in it. Therefore the internal die geometry can be one of the critical factors to determine the cellular structure of foamed layers in multilayer films or sheet. In addition to the pressure issue, melt temperature is also a very important parameter because the melt strength that is inversely proportional to melt temperature plays a key role in preventing cell opening and gas loss during the cell growth stage. It is well known that the final volume expansion ratio is governed either by the loss of the blowing agent through the foam skin or the crystallization of polymer matrix. When the foam layer is surrounded by encapsulation layers during coextrusion, the gas loss through the encapsulation layers is significantly reduced. 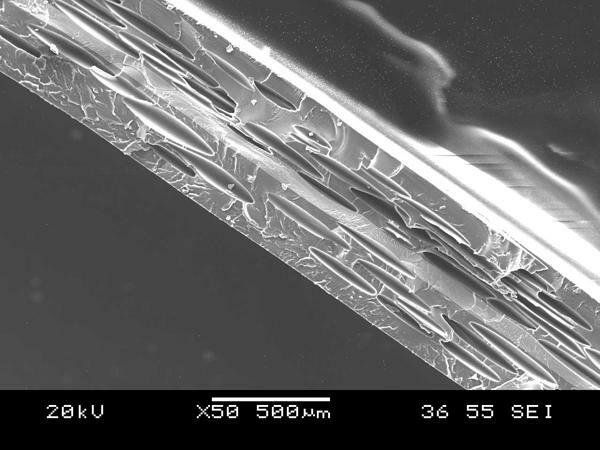 Nevertheless, abnormally high melt temperatures can rupture most of cells and deteriorate the overall mechanical strength of the coextruded structure. This indicates that there is an optimum melt temperature range for achieving maximum expansion. If the melt temperature is too high, the maximum volume expansion ratio is governed by gas loss. When it is too low, the volume expansion ratio is governed by the solidification of melt. In the case of semi-crystalline polymers, melt temperature control is more difficult not only because the viscosity of melt is more sensitive to temperature but also because the crystallization behavior needs to be considered. This means that semi-crystalline polymers have narrower processing windows than amorphous polymers as far as the foaming process is concerned. One of the issues related to coextrusion foaming is instability of the interface between the foamed layer and the non-foamed layers. In cases where a large amount of PBA is incorporated in a layer of coextrusion, the viscosity of the melt can decrease by 30% to 70% compared to the same melt without blowing agents. Therefore the viscosity ratio between the gas-dissolved layer and melt layer without blowing agents can get far from 1 and the potential for interfacial issues rises. Interface distortion between these two layers can also occur due to elasticity mismatch, which makes it very challenging to make the thickness of each layer uniform. Thus, the temperature of each layer has to be optimized to match the viscosity of the gas-containing layer with its neighbouring non-foaming layer. It is usually believed that the viscosity ratio should be in the range from 0.8 to 1.2 in order to obtain excellent coextrusion product with a uniform interface. Sometimes it is very difficult to match the viscosity particularly when the desired density is quite low. In this case, a multi-manifold die is inevitably recommended in spite of the additional cost of the equipment. 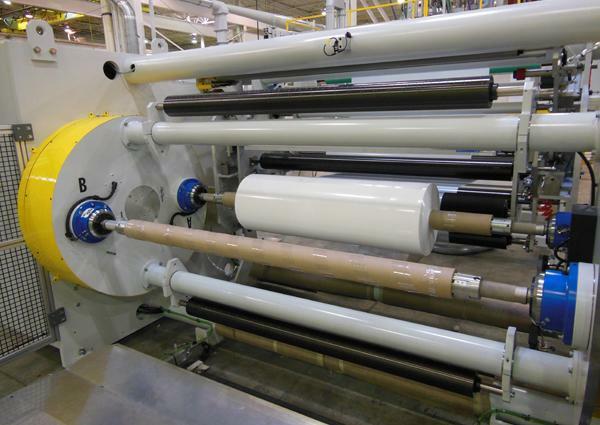 Film and sheet extrusion machinery supplier, Macro Engineering & Technology Inc. (Canada) recently developed a 7-layer coextrusion cast extrusion line to produce multilayer barrier sheet by injecting supercritical fluid of nitrogen into two of the seven layers (Figure 4). A sophisticated feed-block was installed to spread the 7 layers of melt flow, avoiding the need for an expensive multi-manifold system for coextrusion. In this application, the sheet improves the sealing performance when it is used beneath a beverage lid because the cells of the foam layers that are slightly compressed between a lid and a bottle try to recover the original shape and enhance the seal. The extrusion system was designed with versatility in mind, as it was also capable of extruding 7- layer films without foaming simply by blocking the injection of the blowing agent. However, for the thinner flexible films, blown coextrusion foaming is believed to be the better technology for production. It is safe to say that foamed multilayer packaging film and sheet will continue to expand in application range thanks to the distinguished barrier and sealing performance, combined with economic benefits of material reduction. There are many factors involved to successfully produce quality multilayered structures with foamed layers, including materials, densities, cell size and configurations, and machinery considerations. To enhance the cell morphology in the film or sheet structure, it is required to select an appropriate cell nucleating agent to suit the film/sheet structure, materials and end application. It is imperative for process engineers to be capable of accurately optimizing the many processing variables involved in multilayer coextrusion process to ensure the viscosity of each layer and melt temperatures are precisely set to prevent interface distortion. Machinery suppliers must draw on a great deal of knowledge on material formulation and foam process control to continually develop coextrusion technologies that will expand the range of applications on a production scale.